Prime Minister Manmohan Singh isn’t in the habit of talking about himself. But, on Monday evening at New Delhi’s Hyderabad House, he told his Bangladeshi counterpart, Sheikh Hasina, seated across the table, “Excellency, it is I who had co-authored the report on Bangladesh’s reconstruction in 1972.” That report had laid out a blueprint for reconstruction of a war-ravaged country born only a year ago. Manmohan’s recollection was meant to assure Hasina and her delegation that he was just the person who would appreciate Bangladesh’s pressing need for development. This awareness, as Manmohan stressed, arose from India according “highest priority” to its relations with Bangladesh, ready to be a “full and equal partner” in Hasina’s attempt to realise her vision of social change and economic development for her country. Touched, Hasina recalled India’s “unflinching” support to Bangladesh during its liberation struggle and in the early years of its freedom. These exchanges between Manmohan and Hasina, political as well as sentimental, were reminiscent of the relationship India and Bangladesh had once shared—trustful and aglow with warmth, a veritable entwining of two destinies. Between those early years and January 2010, successive regimes in Dhaka, either military or right-wing Islamists, typically portrayed India as the neighbourhood bully contemptuous of Bangladesh. They stoked anti-India sentiments and provided shelter to any militant group wanting to wage battle against New Delhi. Sheikh Hasina’s visit (January 11-13) has been hailed as a harbinger of new times or a return to those early days of camaraderie. 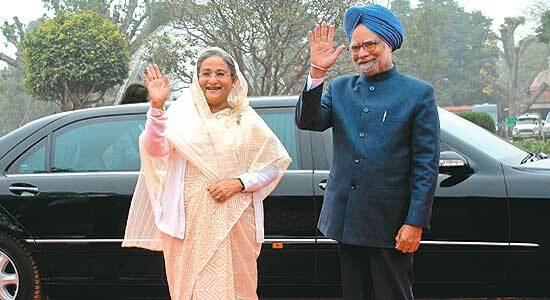 So, what has changed in India-Bangladesh relations that engenders high optimism? Why are the two keen to strengthen their ties? Hasina’s landslide win, as well as Bangladesh’s changed internal dynamics, have eased the old India animus. Hasina’s visit has yielded other gains for India too. It now gets access to the Chittagong port, a privilege it had been asking for decades. This will also enable India to move goods to and from the Northeast faster. A climate is now being created for setting up joint projects for Indian businessmen in Bangladesh. In a quid quo pro, India has extended a $1 billion line of credit to Bangladesh for developing its infrastructure—the largest amount Delhi has pledged for any country. This should help the Hasina government in convincing its domestic audience that cooperation, not confrontation, with India yields rich dividends. Hasina could cite other examples as well—such as the Indian PM’s promise that India wouldn’t carry out any construction on the Tipaimukh Dam project that some consider inimical to Bangladesh’s interest. Manmohan also agreed a ministerial-level meeting was essential for discussing the issue of sharing waters of the Teesta and other major rivers. “Anti-India feelings” among some back home can be dispelled if there is good development, feels a buoyant Hasina. India has chosen to invest heavily in Hasina, acceding to the many items on her wish-list and conferring on her the Indira Gandhi peace award, in recognition of her sacrifice and determination to fight against those who want to destroy the peaceful and pluralistic nature of Bangladesh. Hasina’s visit was given top billing. She met a string of leaders from former PM I.K. Gujral to Sonia Gandhi and Pranab Mukherjee. There was also a subtle stress on the Bengaliness common to both lands. Hasina gifted the famously delicious Padma Hilsa to railway minister Mamata Banerjee, who claimed the fish was cooked and devoured the same evening. The two countries agreed to commemorate the 150th birth anniversary of Rabindranath Tagore through a series of cultural programmes. An upbeat Bangladesh foreign secretary, Mohammed Mijarul Quayes, said, “We are looking at both tangible as well as intangible gains in our relationship.” But the rediscovered bonhomie in itself stresses on the need to put in place a framework of relationship that would not be subject to the vagaries of change in government. Indeed, the relationship shouldn’t slip into the grooves of past animosity. This is necessary, as India wants to showcase its ‘new’ relationship with Bangladesh to those in South Asia who view New Delhi with malevolence. India’s eloquent message? Should you look after India’s concern, it will be willing to walk more than half the way.